As on date, in India 4 WLA operators have gone live i.e. The largest numbers of ATMs have been deployed by Tata Communications Payment Solutions Ltd.
Each WLA is following a distinct marketing strategy to achieve the roll-out target committed to Reserve Bank of India. Tata Communications Payment Solutions Ltd., is setting up its ATMs in educational institutions spread across India. Setting up ATMs in educational institutions not only minimizes the investment in infrastructure but also assists in having a captive user base. BTI Payments has adopted the mode of ‘ATM in a Shop’. Muthoot Finance is setting up its ATMs in its branches with a focus on rolling out prepaid cards. A part of Gold Loan will be loaded into the Prepaid Card, and the Loan holders can withdraw the amount as and when needed. Prizm Payment Services has christened its ATMS as “Money Spot”. 15,000 Indicash ATMs in the next 3 years – Are you willing to rent your space? 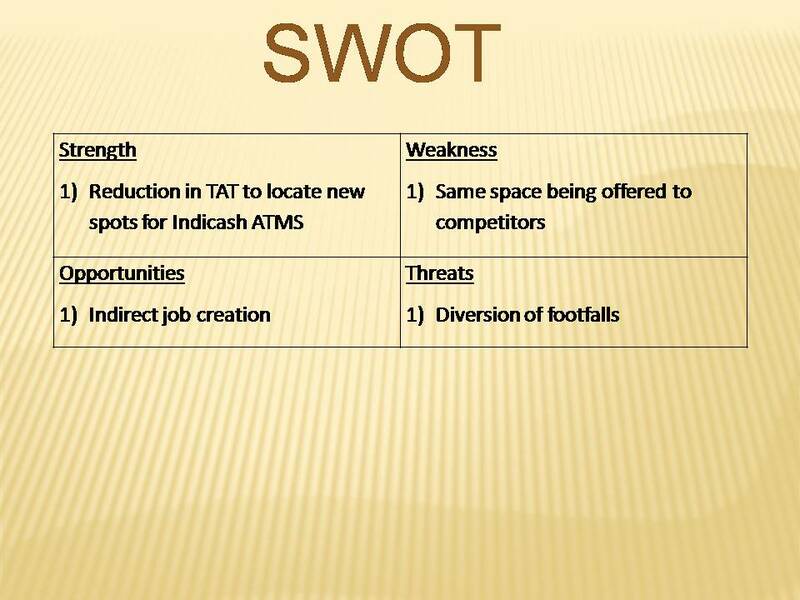 Tata Indicash has thrown open 950+ ATMs in the last few months. The target is to open 15,000 Indicash ATMs in the next 3 years. 67 percent of the ATMs will be deployed in semi-urban and rural areas. The remaining 33 percent will be deployed in metro and urban areas. Towards this end, Tata Communications Payment Solutions Limited (TCPSL) is inviting space owners to get in touch with them and partner for Indicash ATM in their premises. Tata Communications Payment Solutions Limited (TCPSL) is the first company authorized by RBI to open White Label ATMs in the country. As on March 2013, TCPSL manages 27,000 ATMs for banks in India as on March’13. If you have a space fit for an ATM, please fill the simple form with details about your property, upload a few snaps and we will be more than happy to partner with you. All 5,630 Karnataka Gram Panchyats to have Bank Branches/ATMs. Is Cash@POS a better option? Out of the 5,630 Gram Panchayats in Karnataka, Bank Branches/ATMs are yet to make an entry in 2000 GPs. The NREGA (Mahatma Gandhi National Rural Employment Guarantee Act) wages are disbursed through EBT (Electronic Bank Transfer) to the beneficiaries accounts. In 2012–13, the RDPR deposited nearly Rs. 1,600 crore in banks for payment of wages to MNREGA beneficiaries. But business correspondents disbursed only Rs. 70 lakh to beneficiaries residing in unbanked villages. In the first six months of the current fiscal year, the RDPR spent Rs. 850 crore and deposited Rs. 500 crore in banks for payment of wages to beneficiaries. The beneficiaries approximately had to spend a full day to visit the nearest bank/atm to withdraw their wages from the bank accounts. The operation of branchless banking model by various banks through the appointment of business correspondents in villages has delayed payment of wages in unbanked villages. Due to the poor performance of business correspondents, delay in the payment of wages by banks, and also to reduce travelling time and expenses, the RDPR has asked to conduct mapping of all GPs to set up ATMs. A total of 1,52,110 households are working under the job scheme as on November 3, 2013. A total of 9,841 households completed 100 days of work. For payment of MNREGA wages, banks have been implementing the Electronic Benefit Transfer (EBT) scheme in seven districts — Bellary, Gulbarga, Chitradurga, Yadgir, Chamarajanagar, Dharwad, and Mandya. A total of 4,29,767 accounts were opened in these districts. EBT is a smart card-based project for payment of MNREGA wages and other social security benefits. The State government paid the cost of Rs. 95 per card. The EBT system can eliminate bogus claimants and help the exchequer save money. The State government has been paying transaction fee to the banks implementing the EBT scheme. To speed up the opening of WLAs across the nook and corner of India, Reserve Bank of India, today vide its Circular has clarified on a bothersome operational aspect. The Original WLA Circular is DPSS CO PD No. 2298/02.10.002/2011-12 dated June 20, 2012 which laid down guidelines for non-bank entities to set up, own and operate White Label ATMs in the country. RBI has been receiving certain queries on some of the provisions of above mentioned circular. In particular, the issue relating to the perceived restrictions on cash handling prescribed in Para A.4 of Annex B of the above circular “…..At no point of time, the WLAO or his agents shall have access to the cash at the WLAs”has been raised in the recent meetings held with authorized WLAOs and select banks to review the progress made so far in operationalization of WLAs. The rationale behind the instruction quoted above was to ensure that the cash sourced from the sponsor bank only is loaded into WLAs, thus ensuring quality / genuineness of the notes. However, subject to the sourcing requirement discipline as stated in the aforesaid circular, taking into consideration the difficulties expressed by stakeholders in operationalizing the WLAs, last sentence of Para A.4 of Annex B to circular PSS CO PD No. 2298 / 02.10.002 / 2011-12 dated June 20, 2012 reading as “At no point of time, the WLAO or his agents shall have access to the cash at the WLAs” stands withdrawn with immediate effect. Other instructions given in the circular remain unchanged. Cash Management at the WLAs will be the responsibility of the Sponsor Bank, who may if required, make necessary arrangements with other banks for servicing cash requirements at various places. While the cash would be owned by the WLAO, the responsibility of ensuring the quality and genuineness of cash loaded at such WLAs would be that of the Sponsor bank. At no point of time, the WLAO or his agents shall have access to the cash at the WLAs. With the above clarification it is expected that the WLA roll-out will speed up.